MISS NATASHA ENQUIST: ELECTRO-ACCORDION CHANTEUSE: Too many accordions??? I think it's already happened. It occurred after I got the first two... the collections of Accordions, and any instruments is a fantastic disease. You keep acquiring them. You can't stop. The latest addition is a cute little toy made in Italy, with a cute bird name "Capinera". Very sweet little green thing. Doesn't have a great sound, sorry Capinera. Luckily all my other Accordions, also Italian, sound beautiful! I was told an Accordion joke this evening. It cracked me up, although it was mean-spirited. ~~A young couple, who are both musicians, needed to stop at a convenience store. They parked their convertable in the parking lot, and the boyfriend grabbed his violin from the backseat. The girlfriend kept walking and the boyfriend asked "Aren't you going to take your accordion in with you??? You know what happened the last time..."
She proceeds into the convenience store, leaving her accordion in the backseat of the convertable. 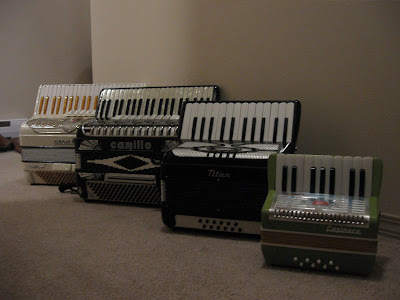 They both return to find 4 accordions in the backseat.